1. To make the dressing, place the coconut milk in a small saucepan over medium-high heat until boiling. Add the lemongrass, 4 Keffir lime leaves, chili flakes, half of the shallots, half of the galangal (thinly sliced). Once boiling, reduce heat and simmer for 30-45 minutes, until it has reduced by more than half. Let cool then strain into a small bowl. Discard the bits (or eat them, they are very tasty!). Combine with the agave, tamarind, sesame oil and soy sauce. The dressing should be refrigerated until the salad is to be served. 2. Meanwhile, prepare your noodles. For kelp noodles, just rinse and drain. 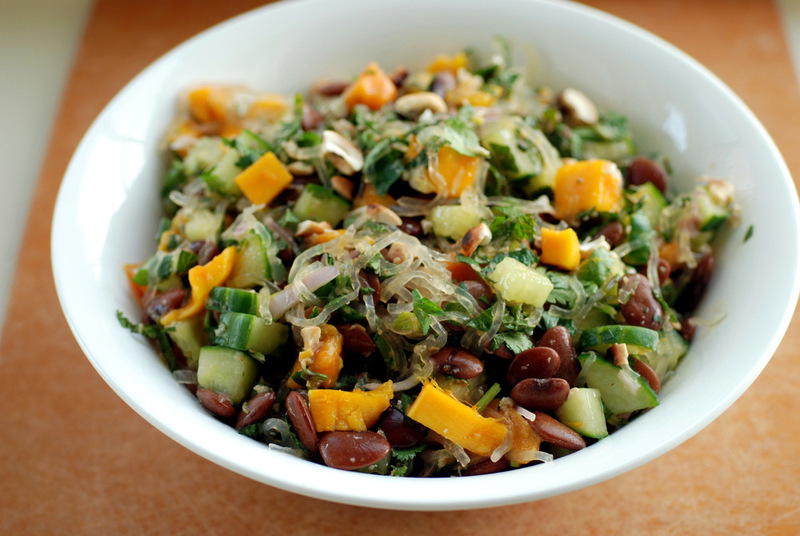 Combine with beans, mango, cucumber, cilantro, mint and salt. Thinly slice the 2 remaining lime leaves, grate the remaining galangal, thinly slice the shallots and add to the salad. Toss to combine. 3. Just prior to serving, add the dressing (you may not need all of it), sprinkle with lime juice and scatter cashews overtop. Season to taste. I loved all of the fruit and jugos naturales in Chile too. My favorite was lucuma. 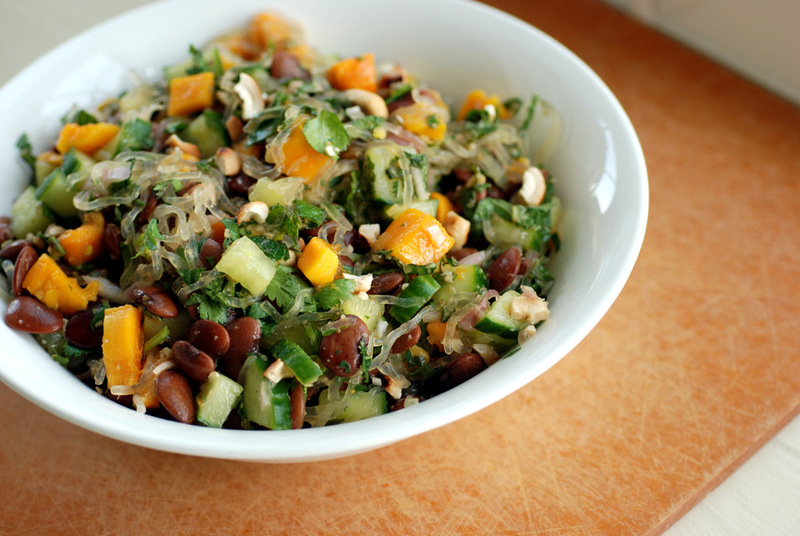 This looks fantastic – I’m always looking for new ways to use kelp noodles! I’ve never even heard of kelp noodles–guess I need to pay a visit to my local Asian grocery, huh? Regardless, this looks like an amazing combination. Hey Eileen, Any noodle would work for this. Ottolenghi originally suggested soba noodles, I think. Kelp noodles are one of those hard-to-find commodities that you’ll likely find at a health food store, though. Oh wow….I so wish we lived closer so I could stop by for dinner. What an amazing food adventure you had in Columbia! Wow, you tried so many interesting fruits! I think I’ve only ever tried two of those…and I would never be able to remember all their names or be able to identify them again! That salad sounds so flavourful too…that dressing would be amazing with all those Thai ingredients! That’s a smart idea – especially if you want to remember the ones you liked to try to find them again. It also helps that the people selling them know what they are…the last unidentified fruit I bought from my local supermarket turned out to be something different from what I thought, and the store clerk wasn’t helpful at all in identifying it for me! 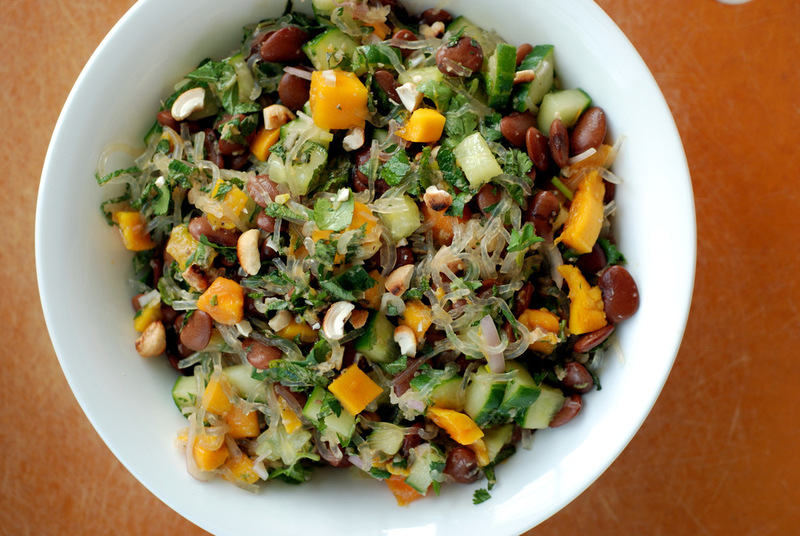 I have not yet quite fallen in love with the texture of kelp noodles but this colorful salad makes me want to try again. I think I could also just drink the dressing on its own too. 😉 Thanks for sending it to Souper Sundays. Yummy! Love the flavors in this salad. I’ve heard of kelp noodles but never tried them. Must look out for them! Thanks for sharing this with Summer Salad Sundays, look forward to seeing you again soon. I bought a mamey when I was in Hawaii in early January, but it was not yet ripe by the time we left and I couldn’t bring it with me, so I still don’t know what it tastes like 😦 I have to look for kelp noodles: they sound interesting. This looks like a very nice noodle salad: thank you for contributing it to Presto Pasta Nights. Wow, what an adventure with fruit. I would just love to try all those different types of fruit. It is my dream to travel more and grow my own fruit somewhere with a better climate. All our fruit is imported and it’s so tasteless most of it and all looks exactly the same size and shape, very plastic. I always thought fruit shouldn’t taste like this, and who would need to eat unhealthy desserts if you had all those different types of fruit on offer. What took you to Columbia? Sounds very interesting! Fresh fruit is nature’s present. When I went to Iceland, I was appalled by their fruit – it was not even comparable to what we get. I prefer local, seasonal fruit when available.. I have only tried the unique Colombian fruits here as frozen purees.